Protein powders are derived from various sources, such as milk, soybeans and eggs. The purpose of these supplements is to provide you with a concentrated protein source for maximum absorption and utilization by your body. Consuming the correct amount of protein powder is critical because too much is potentially dangerous or at least ineffective. As with any supplement, be sure to consult your doctor before trying it. A 2008 study published in "Nutrition and Metabolism" took a look at how protein shakes influenced muscle mass and fat loss in obese subjects. The 12-week study showed that two protein shakes per day helped the participants lose more body fat and maintain more lean muscle mass than participants who didn't consume daily protein shakes. The amount of protein powder consumed in this study was 20 g per day divided equally between the two shakes. The shakes were consumed once before breakfast and once before dinner. If you exercise regularly, you may benefit from an increased amount of protein in your diet; this is where protein powder may help. According to Debra Wein of the National Strength and Conditioning Association, both endurance and muscle-training athletes can benefit from a 30 g to 40 g protein shake immediately following each daily workout. This protein helps to promote protein synthesis, which is the process of replacing broken down muscle tissue and maintaining lean muscle mass. Protein powders are generally recognized as safe when consumed as directed, according to the University of Illinois McKinley Health Center, which states 20 g to 25 g of whey protein per day is beneficial for general health while athletes in training may benefit from 40 g to 50 g per day. 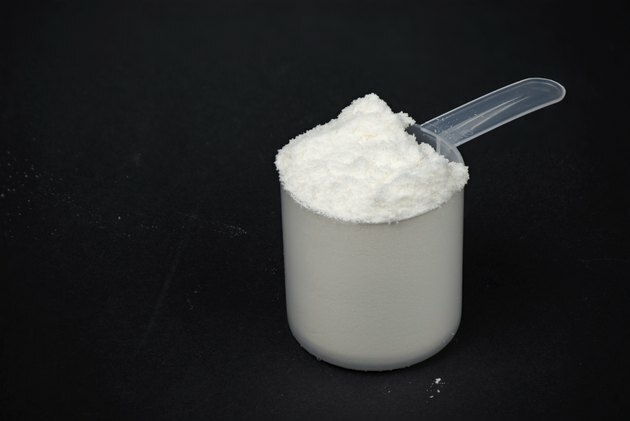 Despite the fact that protein powders are safe in most cases, like other supplements, they are not regulated by the Food and Drug Administration. Thus, it's best to consult your doctor to be sure protein supplements are right for you. It's important to not exceed your daily protein needs when adding protein powder to your daily intake. The Centers for Disease Control and Prevention recommends making 10 to 35 percent of your daily calories from protein sources. Be sure to factor in the protein you consume through dietary sources. The CDC says consuming too much protein can lead to unwanted weight gain, kidney problems and increased cholesterol levels. Does Protein Powder Mess Up the Liver?